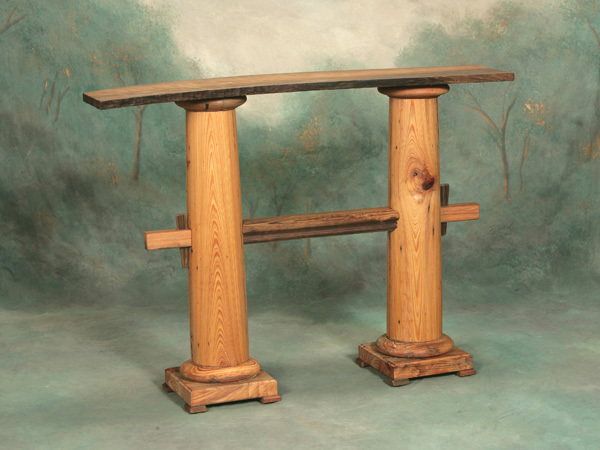 This Stonehenge table is modeled after its name sake. This one of a kind piece features a top that is uniquely curved along the grain lines. The post once adorned a front porch in Maurice, Louisiana. The stretcher is a cypress handrail from a staircase in an old house in south Louisiana. The top is virgin sinker Cypress harvested from the Atchafalaya basin near Morgan City, Louisiana. Excellent as a stand alone piece for display, or as a small bar for entertaining. 35"H x 15" x 48". Finished with linseed oil.